1) This paper has been prepared as a keynote paper to the 2nd FIG Regional Conference in Marrakech, Morocco, December 2-5, 2003. It is also a background paper for the Round Table on Surveying/GIS Education in Africa which is organised December 2, 2003 in Marrakech. The author introduced a paper on trends and needs in survey education (1997) by stating that “the survey profession world-wide is faced with the necessity of having to redefine its role in society and technology. It is threatened with marginalisation, down grading to a service provider and, potentially, loss of its professional status unless a new professional profile is developed and supported by education and practitioners alike.” The profession worldwide, but especially in the developed world has largely responded well to the challenges of this period of change and paradigm shifts. New technologies were embraced readily and the area of geo-information was integrated in the survey discipline. Educational institution partly lead the way in this process and partly followed reluctantly, adapted their syllabi the name of some departments were changed to incorporate Geomatics or Geoinformatics in one way or other. However, this is not true for large sections of the profession in Africa (throughout, this paper uses “Africa” to refer to Sub-Saharan Africa excluding countries of the Sahel and North African region) and especially the educational sector is under increased danger, and in some countries close to complete collapse. The paper addresses the situation of surveying/Geomatics in sub-Saharan Africa from the perspective of a survey educator in Africa. The author perceives the profession in Africa as being under severe threat as a result of a number Africa-specific as well as internationally occurring phenomena, among these are the economic situation in Africa in general and specifically that of educational institutions, the image of the profession, donor policies, the development of black-box technology, lack of resources and political instability. The author is not qualified to make an assessment of the economical and political situation of the African continent in all its complexity, uncertainties and contradictions. Numerous papers and reports on these topics have been produced over the last decades and every possible political and economical theory and philosophy has been applied in attempts to solve Africa’s problems. Many of the proposed solutions are unrealistic, while the valid models often encounter unforeseeable problems beyond the control of both the African population and the developed countries involved in development activities. The paper is based on the author’s experience as external examiners in six African Universities, visits others as well as to numerous survey offices in Africa and work with African professionals. On this bases some general observations are made regarding the situation of educational institutions and the profession. Salaries are generally low and academics have to spend significant time on external activities to augment salaries. The picture painted here is bleak and fortunately not reality in all African Universities and institution, but it is certainly true for many, if not the majority of educational institutions and government as well as private survey offices on the continent. There are some exceptions, and some Universities in Africa, albeit very few, can offer facilities which come closer to similar institutions in the developed world, but none have the facilities and resources of these institutions, with the possible exception of South Africa. As anecdotal evidence one can quote the extreme case of a regional government survey office, responsible for the land administration of a large region in East Africa. Not a single computer found in this office and cadastral records are kept in the form of pencil drawings on a 1:50 000 topo-map. Beyond the issues raised above, many educational institutions suffer as a result of their typically very small student numbers. Small student numbers render the departments or units relatively insignificant within their respective institutions. Thus, educators in the discipline have little access to the resources required for a modernisation of departments or for marketing and often cannot respond to the needs as they would wish to. On the other hand, educators have to deal with pressure from practitioners who, not infrequently, hold the view that an entirely needs-driven approach is appropriate in education and that the profession should guide the educator. The author believes that educators need to be more proactive than reactive. They must accept the responsibility and be given the freedom to provide vision and guidance. Their ability to extrapolate into the future, understand trends and explore new ground beyond the present boundaries of the profession will provide skills and knowledge for the future. If educators fail to interpret trends correctly or explore new avenues, then there is real danger for the survey discipline to become an insignificant service provider with a low profile. Little development will take place in the discipline and many of its traditional areas of expertise may be taken over by others. This potential downgrading of surveying is an international threat, but especially threatening in the African context, where the constraints of limited educational budgets often make it difficult to address questions of education which go beyond mere survival. Unfortunately one, not infrequently, encounters the argument, that cartographic needs in Africa are largely unchanged, that conventional survey skills are still required and that thus education can follow its conventional form for some time and that the concerns voiced above are not yet relevant for Africa. While this argument may have some merit, it is basically defeatist and could lead to the demise of the discipline in Africa. First world expertise and black-box mapping systems are likely to dominate the region and African surveyors/Geomaticians could be reduced to purely operational functions. This must be avoided under all circumstances. African institutes of education must educate internationally acceptable and marketable experts, world class scientist must come out of the research units of African Universities, appropriate technologies for Africa must be developed in Africa and African experts must manage activities with African technicians responsible for the execution of such activities. All this must be done on the basis on first world knowledge and in close contact with international educational institutions, but nevertheless with a high degree of independence and self-reliance. 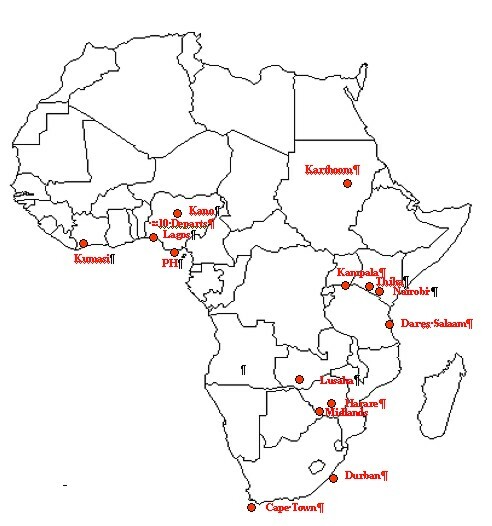 At first sight (Figure below) the distribution of survey departments in sub Saharan Africa does appear somewhat sparse but by no means desperate. However, viewed against the lack of current maps, the need for development and specifically the situation at individual institutions, the picture is much less encouraging, if not outright dismal. A brief assessment of the situation of survey/Geomatics Departments in the sub-Saharan region will show the reality of discipline related education in this region. Beginning with South Africa, in the early 1970s there were five independent departments, one each at the Universities of Johannesburg, Pretoria, Durban, Fort Hare and Cape Town, with just under ten Chairs of Surveying or Photogrammetry. Today, there is not a single independent Department in South Africa and only one Chair of Geomatics has survived. Departments in Pretoria, Johannesburg and Fort Hare were closed as a result of poor student numbers, while the Durban department was amalgamated with Civil Engineering and is left with three full time staff members. The Cape Town department has recently been incorporated with the School of Architecture, Planning and Geomatics withy five remaining staff members at the University of Cape Town, one of which is the Chair of Geomatics. Unconfirmed reports from Botswana indicate that a Survey department will be established at the University of Botswana in Gaberone. This is a surprising development for a country with some 1.5 million inhabitants, in view of the closure of departments in neighbouring South African with a population of more than 40 million. A survey diploma, previously offered by the Department of Civil Engineering, has been discontinued some years ago. In Zimbabwe there are two University Departments, one at the University of Zimbabwe in Harare and one recently established at the State University of the Midlands. The Harare department has at present one staff member while the newly establish Midlands department with three full time staff members seems to be growing in relevance and might well take on the previous role of the department in Harare as the leading department in Zimbabwe. The University of Zambia has a survey department, which appears to be severely under-resourced and little is heard about activities in the department. Staff members of the Zambia department show no presence at conferences and symposia in Africa and no research papers have been published in journals. One of the more fortunate countries, as far as surveying education is concerned, is Tanzania, where a Department exists at the University College for Land and Architectural Studies. The department with close to twenty staff members and over 100 students has grown out of the former Ardhi Institute and has made an excellent effort to grow from a Technikon to a University level. Nevertheless, the department experiences all of the typical problems of insufficient equipment, few computers, poor Internet facilities, frequent power cuts and very limited resources; also, there is no Chair of Surveying at this institution. Moving further north to Kenya, there are two departments, one in Nairobi and one recently established at the Jomo Kenyatta University of Technology in Thika. The department at the University of Nairobi, with 13 staff members and 150 students, belongs to the small group of survey departments in Africa with a significant tradition as an institution of higher survey education. As far as facilities, resources and problem areas are concerned, there is little difference to other African institutions with the one exception that there is an established Chair of Surveying. The department at Jomo Kenyatta is three years old and has an academic staff of four and 75 students in three years. They are provided with teaching assistance from staff members from the University of Nairobi and the UN-ECA Regional Centre (RCSSMRS) in Nairobi. The department at the Makerere University in Kampala, Uganda with 12 staff members and some 50 students is one of the oldest survey departments in Africa, but today, suffers from the same difficulties as other African departments. Survey departments also exist in Khartoum, Sudan and Kinshasa, Zaire, but the author was unable to obtain any information on these two institutions. Judging from the lack of presence at African and international survey related conferences and in survey publications, one must assume that activities at these departments are limited and it is unlikely that resources are sufficient to develop international status. In West Africa there are two countries with University Survey Departments, Ghana and Nigeria. In Ghana there is a department at the University of Kumasi, while Nigeria has a virtual glut of survey departments. Here a total of nine University departments offer a degree in Surveying and training in the form of short courses is provided at a Regional Centre (RECTAS) in Ile Ife. Reports from this country also indicate a dearth of resources in Geomatics Departments. It is noteworthy that there are only two remaining University Chairs for Surveying between Cape Town and Khartoum including the entire African Region South of the Equator. This is a clear indication of the status and relevance of survey departments in the eye of University authorities in this area. The UN-ECA Regional Centres play an important role in training, consulting and coordinating of survey initiatives in Africa, but they do not provide education in the traditional sense. They offer short courses and thus fill an important gap, where Universities lack the human resources. In view of the above, there can be little doubt that survey education in Africa and subsequently the profession itself is under severe threat. Too few and insufficiently prepared graduates enter the profession and, due to their numerical skills, their ability to think in a structured and logical fashion and their understanding of spatial problems, the best candidates are often ‘pirated’ by companies and institutions without activities unrelated to surveying. This threefold relevance of research is often overlooked and research is evaluated solely on the basis of the second criterion, the tangible research output. The author is of the opinion that the first objective, the personal development of the student, is of much higher relevance in post-graduate research than the research product. One can even go so far to premise that gaining knowledge in the particular research area, as important as it may be, is of secondary relevance for the development of the students and that the ability to abstract from the literature, analyse critically, structure thoughts in a logical fashion, formulate a readable document and learn self management should be the principal objectives of post-graduate research. Post-graduate research is also essential for the supervisor, who is forced to continually improve own knowledge and critically assess own understanding of the discipline and the research area. The author firmly believes that excellence in teaching at university level is primarily based on the teacher’s research activities. Further, the improvement in professional maturity observed by the author in post graduate students under his supervision has convinced him of the invaluable contribution made to the profession through post graduate programs. Africa is in desperate need of academics and professionals with research experience and Africa based post-gradate education is essential. Most unfortunately, at present survey/Geomatics research and post-graduate education is restricted to very few departments on the continent. It is therefore most important to establish post-graduate programmes, both in the form of taught courses and full research projects, at African Universities. the previously mentioned need for academics to spend a significant amount of their time on consulting and other activities to ‘make ends meet’, leaving little or no time for the unlucrative business of research. Africa based research is one of the principal factors with a potential to improve the situation of Geomatics education in Africa, as it will raise the status of departments within Universities, increase the relevance of Geomatics in an national contexts, improve teaching capacity, create a wider interest for academic staff and thus their commitment to education. The author considers this area as the one where the most significant impact can be made with the least expenses. It must be noted, that Geomatics research projects do exist in Africa, but that these are generally driven from outside with limited local participation. African students largely depend on government subsidies, donor support or bank loans, the latter are difficult to secure and more difficult to repay. Especially students from rural communities suffer in this regard as they typically come from the poorest economic backgrounds and are often supported by their family at the expense of their siblings. In return, they are expected to support large families which have contributed to the students expenses, once the student has graduated. This obligation to the family is taken very seriously and can represent a considerable psychological burden for the student. The inordinate pressure to succeed, resulting from this, can severely affect the student’s frame of mind and his/her ability to study. Concerning Gender it must be mentioned, that in many rural areas the view still prevails that a woman’s role in life is that of a housewife and that a professional career is utterly inappropriate for a woman. Student numbers vary widely, with South Africa, once a country with one of the leading survey education system in Africa, now has the lowest student numbers on the continent, while east African countries and Nigeria have programs with of 10 to 50 students in each of the four or five years of study. The reasons for the low numbers in South Africa are not certain, but likely to be a result of the poor image of the surveying as a lucrative profession, lack of awareness of Geomatics, a reluctance to work in a profession with a field work component and the lack of schools which teach mathematics and science at a sufficiently high level. The relatively large students numbers in other African countries, on the other hand, are a positive development, but must be seen against the situation of a profession under severe threat and the potential lack of employment opportunities. Initiatives are there fore required to improve both, the situation of the profession and education on the continent. On the optimistic side, one can report that the change from surveying to Geomatics has had some positive effect on the demographics of the student population. Fieldwork in Africa is not without hazards and the thought of having to spend weeks in the field as a female has previously made the survey profession unpopular with female school-leavers. Geomatics has a different image and is not perceived as being associated with extensive periods of fieldwork; as a result, larger numbers of female students are now registered. There can be no question regarding the necessity for international support for Africa. However, one can question the form this support takes. With respect to surveying there are two aspects which are relevant, these are graduate and postgraduate student support and project funding. It has been a tradition for donors to provide bursaries for African students for studies in universities of the developed world and specifically the donor country. As valuable as such support is, it also has its severe disadvantages. Having experienced the quality of life in a developed country with all its material and academic resources, many of the best students choose to remain and enter academia or industry in a country outside Africa. Those who return, on the other hand, face working environments where they have no access to any of the equipment or software they have been exposed to during their studies. In fact, they might be quite incapable of coping with these limitations and frustration can set in. A further, and possibly more destructive effect of the transfer of students to the developed world, is a reduction in student numbers at African Universities, aggravated by the fact that the best students are selected for overseas studies. This serves to further aggravate the problems of university departments. A change in donor policy in this respect would appear essential, and the most acceptable solution would be a compromise in the form of sandwich-course. Students would then have the opportunity to benefit from state-of-the-art technology and expertise in the developed world without loosing contact with conditions at home entirely. Donors should also consider providing more direct support to African University departments through equipment donations and assistance with South-South networking of institutions, academics and students. Donor activities have an even greater negative impact on the profession through the conditions often associated with the provision of funds for mapping and survey projects. Typically, experts from the donor country are employed and data processing is done in the donor country. Capacity building components are routinely included into donor-funded projects and sustainability is a key issue. In reality however, the human capacity generated during the project is often not utilised once the work has been completed, equipment is unused and gathers dust and the newly trained staff moves elsewhere. It is difficult to identify reasons for this common phenomenon. It would seem that incentives to carry on with project disappear together with international consultants and projects often die a quiet death. Globalisation has not bypassed the survey profession in Africa and numerous firms from the developed world carry out major mapping and survey projects in Africa. With their high-end technologies, stream lined production processes, state-of-the-art hard and software and experienced staff, they represent a fierce and practically unbeatable competition for the African professional surveyor, who can at best hope to obtain a sub-contract in one of the internationally financed projects. The divisions are not merely nominal and have inhibited the flow of information and movement of individuals between regions, a phenomenon also reflected in survey/Geomantics activities. Language is the principal medium of education and the language division plays a more significant role in this area than in most other spheres of professional activities. There is little mutual knowledge of educational institutions in Africa, standards differ, staff exchange is very limited and students seldom transfer between institution within Africa and typically prefer to advance their studies elsewhere. There still appears to be a perception that quality in education can best be provided outside Africa. Although it must be accepted that - largely for historical and financial reasons- Geomatics educational standards outside Africa are on average higher than in Africa. However, it is equally true that centres of Geomatics excellence do exist in Africa and that there are no reasons why other African institutions could not reach international standards. Recent developments and the activities of international and regional organisation have reduced the level of separation substantially and co-operation is growing. However, educational and professional links of individuals, organisations and countries with the ‘first world’ still appear to be stronger than those within Africa. It is important to change this trend and increase inter-African co-operation at educational and professional levels. the high cost of the systems make them unaffordable for the majority of practitioners in Africa, thus given developed world professionals an edge in tendering for projects. While this is a universal phenomenon, it has a greater relevance in Africa than in the developed world. This is due to the shortage of expertise and the associated lack of quality awareness, where so-called experts are allowed to employ black-box technology to produce low quality products. This can bring the profession into disrepute. More importantly though, it results in the trivialisation of the skills required for spatial data acquisition and these skills are seen as a service providing rather than as a core expertise. Solutions to the multifaceted difficulties and problems highlighted above are evasive and require significantly planning, commitment and change of attitude from both, experts in the developed world and in Africa. Some first steps towards a possible improvement could be:. Survey/Geomatics curricula in Africa vary widely and some have remained unchanged for decades. A modern curriculum content is essential to provide state-of-the-art expertise and make institutions compatible with the rest of the world in the eyes of prospective students and the public. Students are well aware of this need, as recently became obvious when students demonstrated requesting a modernisation of the Geomatics syllabus at an African University. Academic freedom must be guaranteed and each department must have the freedom to design an individual curriculum. One could, however, consider the design of an Africa-specific ‘sample’ or ‘best-practices’ curriculum, which could be made available throughout Africa as a guideline to assist with the development of new courses as well as with the assessment of existing programs and – possibly - the provision of minimum standards for Geomatics education. Other disciplines, such as Architecture and Planning, have introduced post-graduate courses jointly administered and executed by a group of Universities. This approach makes use of the specific strengths and expertise of departments and allows students to experience different African cultures and environments, while making potentially important contacts for their career. Similarly joint short courses could be designed, where instead of the students, the teaching staff moves between Universities and provides lectures in specific areas such as digital photogrammetry, GPS or GIS. Students, staff and professionals alike could attend these courses. Mutual visits between educational institutions and joined research projects are commonplace in Europe and other parts of the world, while they remain the exception in Africa. African educators and experts can more often be found at international conferences and research- or educational institutions, than at corresponding events or institutions in other African countries. Attempts should be made to establish contacts and arrange visits in preparation of joined projects with the objective to create, within Africa, the fertile atmosphere of close co-operation and friendly competition as it exists in other parts of the world. The objective of a united African Geomatics community should be the research and development of appropriate technologies for Africa in Africa and by African technicians, professionals, researchers and academics. This paper can only touch on the problems of survey/Geomatics education in Africa and does not claim to have either identified all difficulties nor does it claim to offer all the answers. A systematic study is required for this purpose and it is suggested that a task group be formed to carry out such a study and assessment of the situation and propose solutions and initiatives. Geomatics departments at universities seldom work in collaboration with other institutions. Therefore, efforts to develop collaborative work involving African educational and development institutions, government agencies, NGO’s and International agencies should be made. An Association of African Survey Educators was formed in the early eighties at a meeting in Cape Town arranged to address educational issues in Africa. The author chaired this Association, which proved a total failure and a perfect example of ‘how-NOT-to-do-it’. Members of the Association were undoubtedly committed to the cause, but none of the planned activities could be implemented nor were there any further meetings, as no funding for such initiatives could be secured. The author believes that it would be appropriate and prudent to now reconsider the formation of an Association, consisting of staff members of a representative range of educational institutions in Africa as well as a limited number of educators and experts from the developed world. This Association could be tasked with exploring the above listed as well as other Geomatics related initiatives. The experience made previously clearly shows that such an association can only function if it can be formally linked to one or more donors and if financial backing can be mobilised. Donors should be encouraged to not only support studies in the developed world but also in Africa, to provide support for sandwich-degrees with study years in and outside Africa and to financially assist university departments. Further donors should be encouraged to increase the local expertise content in development projects. The paper has highlighted some of the threats to and opportunities of the Geomatics profession in Africa from the point of view of an educator. It is based on the assumption that that the profession has a significant function in the development of sub-Saharan Africa and that survey/Geomatics education is essential for Africa. It suggests that the profession is only sustainable at educational institutions, if a broader view of the profession’s activities is adopted and initiatives are taken to strengthen education in the region. A need to protect the profession in Africa against isolation and downgrading to purely operational levels is recognised and suggestions for self-help development were made. The chance of success for the proposals made here will, above all, depend on the enthusiasm of those participating in the suggested initiatives and on the availability of funding. The ultimate objective of any educational effort in Africa must be donor supported self-help development towards a largely independent Geomatics capability in the region. The paper is subjective and entirely based on the personal views and observations of the author, derived form extensive experience in African Geomatics education and work with survey professionals in Africa. It is not a scientific study of the very complex situation of Geomatics in Africa and therefore no references are provided.